Recently Bishop Blair wrote a letter concerning fund-raising for the Sus an G. Komen Foundation. His clear statement addressed the problem of cancer research and the use of embryonic stem cells. While Susan G. Komen ofNorthwest Ohiodoes not directly fund cancer research, it does send 25% of the collected donations to the parent company which does offer grants for cancer research. Bishop Blair is responsible for imparting the teaching of the Catholic Faith to the people ofNorthwest Ohio. It is a responsibility that he neither takes lightly nor can choose to ignore. In that capacity, the Bishop addressed the sanctity of human life from conception to natural death, one of those teachings. Since some cancer research institutions use unwanted embryos from fertility centers for their research, there is potential that these small human lives are not being respected. In addition to support of life in the womb, Bishop Blair also offered support for those struggling with cancer when he suggested directing donations to the Mercy Cancer Centers. The Northwest Ohio Susan G. Komen Foundation had been sending money to the Mercy Cancer Centers as part of their outreach so the Bishop’s suggestion does not diminish this work. It is very important for us to realize that any past fund-raising we may have done for the Susan G. Komen Foundation, done in good faith, was not wrong. However, knowing what we do now, it is important to direct our donations to life-affirming organizations. 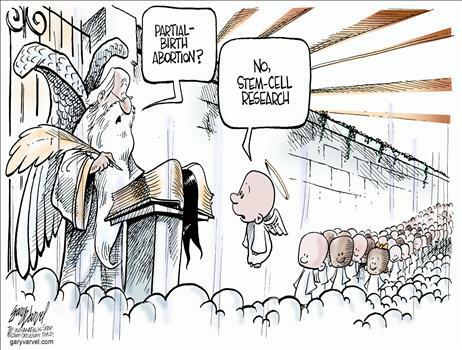 Finally, since embryonic stem cells have been used in research, they have never been proven to assist with any medical condition. In fact, they react much like cancer cells. On the other hand, adult stem cells, which harm no human being, have been proven to help with leukemia, Parkinson’s disease, spinal cord injury, juvenile diabetes, lupus, multiple sclerosis, sickle-cell anemia, heart damage, corneal damage, and dozens of other conditions. Just from a scientific perspective, it does not make sense to direct funds to research that has proven itself ineffective and away from such a viable alternative. I would hope, though, that we would approach this issue through the eyes of faith. I pray that as Catholics we can see that when we treat any human being, no matter how small or vulnerable, as less than dignified, we tear at the very fabric of our own humanity, our connection to the Creator.